The New York Mets have been getting a lot of attention for the past couple of years for their core group of pitching prospects. It turns out they've got some solid hitting prospects coming up through the ranks too. USA Baseball alumni Michael Conforto worked quickly through the team's ranks, getting called up to the big leagues a little over a year after he was drafted. And while collectors will have to wait a while yet for his rookie cards, there are more than a handful of Michael Conforto cards out there already. 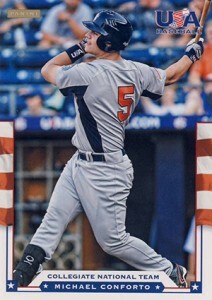 Panini released the first cards of the outfielder in 2012 when he was with the national team. Over the next two years, Conforto appeared on a wide variety of base cards, inserts, autographs and memorabilia cards for the company while representing the stars and stripes. 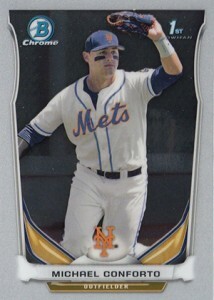 After being drafted in the first round of the 2014 MLB Draft, Topps produced the first MLB Michael Conforto cards. He's one of the few top picks not to have an autograph in 2014 Bowman Draft. That said, he does have both paper and Chrome Prospect inserts in the product. 2014 Bowman Sterling Baseball has his first MLB autograph card. Here's a look at some of the his key prospect cards. These aren't rookie cards because they're either inserts or come from USA Baseball sets, which are considered prospect sets. Click on the links or images to shop for specific cards on eBay. 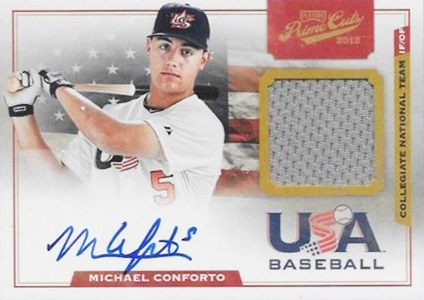 The 2012 Panini USA Baseball box set has a lot of different Michael Conforto cards available. His base card is definitely not the most valuable but because of the factory set format, it's not the easiest card to find. 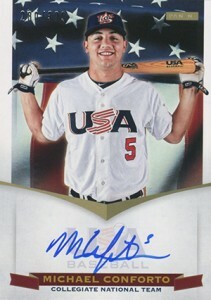 Conforto has multiple autograph cards in 2012 Panini USA Baseball. Numbered to 100, the Collegiate Marks card is the most distinct. The signature is in gold cast against a black backdrop, giving it more pop than more traditional autographs. This card uses a sticker for the autograph, which is a turnoff to some -- especially with the Prime Cuts card that is hard-signed. That said, this one is moderately priced and on the rarer side. 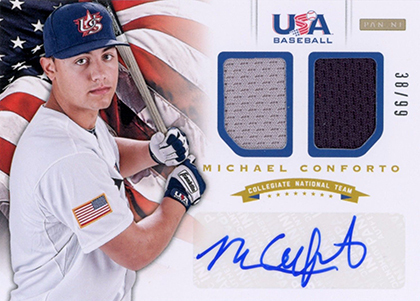 For those looking for a cheaper autograph, there's the 2012 Panini USA Baseball Collegiate National Team Signatures Michael Conforto. Numbered to 399, it's his most plentiful signed card in the product. But unlike the memorabilia cards, it's signed on-card. Initially a pricey high-end product upon its release, 2012 Playoff Prime Cuts can be found for significantly less today. With most of Conforto's first autographed memorabilia cards using stickers, this one stands out for those who prefer on-card signatures. Between 2014 Bowman Draft and the 2014 Bowman Chrome Mini factory set, there are several different ways collectors can find Conforto's first Bowman cards. However, it's the Bowman Chrome Draft version that should be the most popular over time. In addition to the paper Prospect card in the same product, there are lots of Refractors for those wanting the chase element. The outfielder does not have any autograph in 2014 Bowman Chrome Draft. However, the signed version of these cards made their way into 2015 Bowman Chrome. 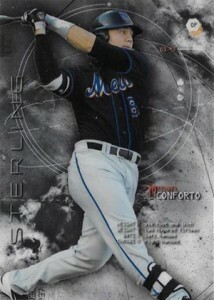 Tougher to find than his Bowman Draft and Bowman Chrome Draft cards, the 2014 Bowman Sterling Michael Conforto commands a premium for a non-numbered card. The base version is actually harder to track down than some of its Refractor parallels. 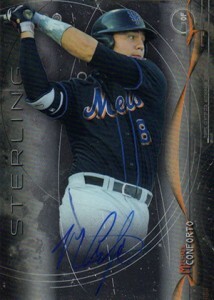 Usually, Bowman Sterling autographs are overlooked in favor of their signed Bowman Chrome counterparts. But without any autographs in 2014 Bowman Draft, this card gains a lot of importance. Although it was inserted in packs as a redemption, the final cards are now out. 2014 Bowman Draft HOBBY Pack Rhys Hoskins? (Nick Gordon Michael Conforto AUTO)?